Inventory We are a resale marketplace, not a box office or venue. Ticket prices may exceed face value. This site is not owned by Kravis Center . The Kravis Center for the Performing Arts opened in 1992 as the primary spot to catch the hottest traveling Broadway shows and smaller concerts in the West Palm Beach area. The Kravis Center has three different theaters with the largest being the Alexander W. Dreyfoos Concert Hall, which has a seating capacity of 2,193. 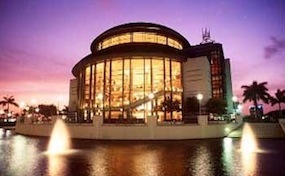 The Kravis Center box office is located at 701 Okeechobee Boulevard in downtown West Palm Beach. Kravis Center tickets have included shows like Les Miserables, Lion King, Wicked, Jersey Boys, West Side Story, and many more. The venue is one of the busiest Performing Arts Centers in the country with over 400,000 guests annually. Kravis.CenterWestPalmBeach.com is not affiliated with any official website, box office, or venue. We are an independently owned and operated company that concentrates solely in online sales in the secondary market. Prices on our sites may be below or above face value and change quickly with consumer demand. To order tickets to all Kravis Center Dreyfoos Concert Hall events simply click on the show of interest or call our operators for more direct service.